Curso donde se expondrá el método utilizado por Peter Westerlund para la construcción de tapas y fondos . Fechas: 11 al 12 de noviembre del 2017. De viernes a domingo. Westerlunds Violinverkstad AB is a growing family business, where the main function is the making of violins, violas and celli. The shop is situated in beautiful Norberg in Bergslagen, and employs Peter Westerlund, Violinmaker and Irene Westerlund, Administrator. 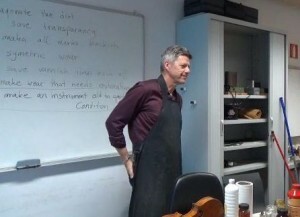 Since the company’s beginning in 1985, Peter has made over 300 instruments (violins, violas and celli). A speciality has become the copying of older instruments. During the period 1998-2003, Irene and Peter arranged weekend seminaries for the proffesional Swedish violin-/bowmakers and restorers. Irene Westerlund is taking care of all the administration in the company. She is the webmaster for the company homepage. During six years, starting 1998, she organised weekend classes for the Swedish violinmakers/repairers.